Who can visit the farm? We believe strongly that Degmo is best enjoyed by families. A visit to the farm creates an ideal opportunity for the knowledge of history, culture and traditions possessed by parents and grand-parents to be handed down to the next generation. Away from the routine of their everyday lives, families also benefit from spending time together and in sharing the experience of learning about their adopted country. We do, however, host visits for groups other than families. For example, pensioners, school children, and non-Somalis who wish to learn about the Somali community, their history and traditions: in fact anyone who has a interest in Somali culture, or the countryside is welcome. Most visits to the farm are arranged and financed through Somali community groups in the UK, however we are happy to accept bookings from private individuals and other organisations. Visitors are welcome throughout the summer with visits available from late spring until early autumn..
We suggest stays of between 2 and 5 nights. Other lengths of stay are available, but we do not recommend visits of less than two nights. .
What should we bring with us to the farm? Much of your stay will be spent outdoors, so suitable clothing and footwear is essential. A pair of waterproof boots, or strong shoes, for walking, a waterproof coat, plenty of warm tops, a hat, and a change of clothing in case you get wet is highly recommended. You should also bring a towel and wash kit and, for sleeping, a quilt or sleeping bag to go under the blankets that are provided for extra warmth. Tents are equipped with lights, but torches must be brought for use at other times..
To ensure the highest level of service and attention to the needs of individuals, at present we cater for groups of no more than 30 persons at a time. However plans are in place to increase numbers to 36. Groups larger than 36 will be possible for special occasions, such as music, poetry and other performance events, but in such circumstances, the additional guests will be requested to provide their own bedding and it may not be possible to offer the same level of participation in the farm activities..
For convenience and to keep costs for all concerned to a minimum, we request that groups visiting the farm arrange their own transport in the form of minibuses. From experience we have discovered that in cities these are available for community use at discounted rates which we are unable to match..
Is Degmo just for Somalis? 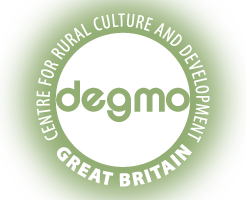 Degmo was established for the benefit of Somalis living in the UK and that will always remain its priority. However, as news of its appeal spreads, an increasing number of enquiries are being received from other communities, especially those whose origins lie in Africa, Asia and the Middle East. We therefore offer a range of farm visits specially adapted to the cultural needs of each community concerned. Please contact us for details. The arrival of the Holy Month of Ramadhan need not prevent you visiting the farm. Why not bring your family and friends and celebrate in the tranquillity of our Degmo? Full facilities for prayer and special fasting menus are available. No neighbours to disturb if you wish to stay up all night, and plenty of peace and quiet for sleeping during the day!